Display Systems Australia started about 30 years ago. 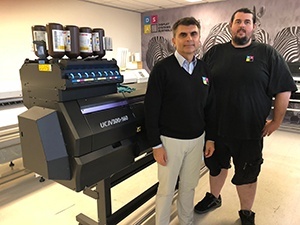 Newly introduced " 2 x UCJV300-160"
Anthony Crosetta, production manager at Display Systems Australia, runs the print room. He says, “We can’t fault the Mimaki printers. They are quick, reliable and the ink is beautiful. LED UV Flexible cured inks is perfect for our needs. Using the Mimaki printers, Display Systems Australia produces quality banners at speed. Pritivera says, “We can’t load them into frames quickly enough. We have banner stands printed up and we need extra people sometimes to put graphics into frames. 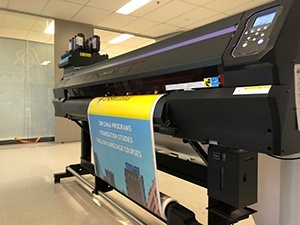 Speed is not an issue.. “Because the LED UV ink sits on top of the media, you get a real texture to your print and our clients like the textured feel in the banner. We have no issues with adhesion and scratch resistance; we are not protecting it with a laminate. 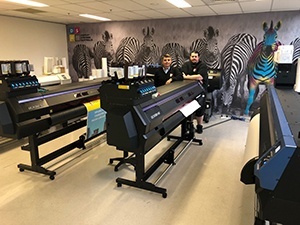 Display Systems Australia says the new ink that Mimaki has placed into its printers, played a part in its decision to invest in Mimaki. John Privitera says, “We wanted to get the flexible ink. It stretches and goes with the printed product. Anthony Crosetta, production manager at Display Systems Australia, runs the print room. He says, “We can’t fault the Mimaki printers. They are quick, reliable and the ink is beautiful. " John Privitera sees value for money in his Mimaki investment and intends to stick with the brand. He says, “Once you are able to introduce white you can match the colours. I am also thinking about buying a smaller one just for running banner stands. The UCJV300 uses Raster Link 6 Plus software and a function called ID Cut. This places a barcode on the printed material which the cut function picks up and then uses to align the cutting head exactly in the right place on the sheet. 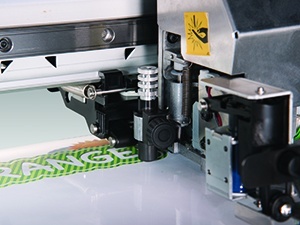 With nested or multiple products, you can automate the whole process because the printer can read and position the cutting head with the information contained in the ID code. As it prints each image, the ID Cut function updates the printer as to where to cut the image. John Privitera says, “The Mimaki printers are absolutely fantastic; fast and economical. We have found them way above our expectations. We are producing some beautiful prints and we are doing some nice work. IndustryAustralian owned company manufacturing a wide range of portable banners, display banner stands, exhibition banners and more for your business advertising.